Hi GP, the major differences are that in Germany you also do personal care (which I haven't done here) and less physical assessment and you have mostly RN's on the ward and only maybe a couple of CNA's per shift. I have also been on wards with no CNA's. So you don't have that much responsibility or rather, you share it with more people. In the States I have worked only Home Health Care which was stressful but I liked it. Right now I'm staying at home with my almost 2 1/2 year old son and I am getting majorly concerned about not finding a job when I want to go back to work, which would be after 3 1/2 of not working. But anyway, as far as working in Germany for you, I think the place to find out what you need to do, is the "Regierungspraesidium". They would be the ones to certify you. There is one in each "state". But once you have your Certificate you can work anywhere in Germany and it does not become inactive. The pay is not as good, that's true. I hope this is of any help to you. Write again if you have more questions. Hello GP, I'm just looking for some exchange on what the experience is like for other german Nurses working here compared to Germany. Lots of things are different. Thanks for your reply! Julie Lyn, I was not trying to say, that the support staff here is not important, they are absolutely vital. But where I used to work were enough nurses so you didn't need a lot of nurses aides. And I did like that better because I had a smaller group of patients and enough time to take care of their needs. I also could be sure that somebody else didn't forget to tell me about important changes in their condition such as signs of complications. And I'm not saying CNAs are unreliable. I just felt more comfortable and I'm sure the patients did too because they knew exactly who was the responsible person for them in each shift. I would have the same patients all week and they would pretty much have the same 3 nurses all week. On the other hand when I delivered my baby in the US I had to wait 1 1/2 hours for some Tylenol on the Post Partum ward and my husband had to help me on the bedpan because nobody showed up to ask what I needed after I rang the call light. And I bet the RNs on the floor never even knew who I was when I walked by them in the hallway. But after all I wasn't exactly sick and with a bottle of Tylenol and a megapack of maxipads from home I did just fine until I was discharged. Hi, I'm a german nurse, graduated from a german nursing school and would like to get in touch with other german nurses in the US. So, if you are one or know one, post a reply. In Germany it takes 3 years to become an RN an it is a diploma program. I spent more time in the hospital clinicals than in the classroom. I don't know of any recent changes since I have been in the US for 5 1/2 years. 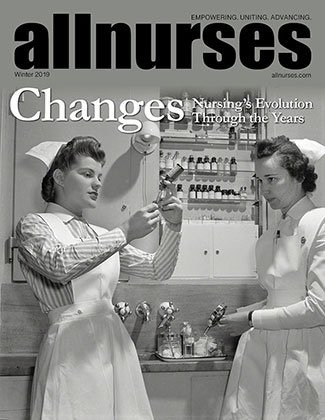 The major differences between nursing in the US and Germany is that RNs do everything, there are very few nurses aides. This is one of the reasons I would prefer working in Germany, I don't have a lot of minimally trained people around me. The other thing is that I have been trained to look at the whole person rather than just the illness the patient is being treated for. The other RNs at my so far only job in the US weren't too concerned about that. You won't be able to work in german Health Care Facilities. But you could probably work in US military hospitals or clinics. i tired to apply for a job in an Arny hospital once but couldn't because I am german. Is your spouse in the military? If you are near an post you could ask at the hospital there how to apply or what to do. Or try ACS, maybe they can help you find out how to go about this.